When we learned we were expecting, I automatically thought about a maternity shoot because I love photos. At the same time, however, we've had our fair share of shoots and we recently bought a nice Nikon to take more photos ourselves. Plus, saving money by not doing a shoot couldn't hurt. I brought up the idea of a maternity shoot with our anniversary photographer, Jennifer Larsen, to Mr. L one day and he said to email her just to inquire. I was a little worried she'd say no because she mainly does engagement and wedding photography. It couldn't hurt to ask though, right? Right! Jen is so sweet and gave us a great deal. Plus, she was so excited and that got me excited! So we picked a date in May. Lo and behold as I was in the salon getting a blow out, it began to rain. We rescheduled for this past weekend and the shoot was so fun. I've got to admit, though, that since I'm bigger (and much more swollen) than I was a month ago, I was a little lot more self-conscious. As someone who's been in relatively good shape all her life, gaining all this weight has certainly induced constant self-critique. I was almost wishing the shoot would be rained out again ... not because I didn't want the photos but because I didn't feel 100% confident being photographed in my current physical form. I'm rather ashamed to even admit that. All in all, we're so excited to get the photos back. This is the most important time of our lives and I didn't want to overshadow that with my body issues. Plus, most of the pregnancy, I have loved my body. As I've alluded to before, I hate the scale, though, so stepping on it every week and knowing that number is annoying. My advice to currently and future pregnant mamas would be to embrace your beautiful body that's doing an amazing and miraculous thing--growing a human. If in doubt, go for the maternity shoot! This is a time to celebrate ourselves, not put ourselves down. All photo credit and thanks to Jennifer Larsen! Linking up with Thoughts for Thursday and Confessional Thursday. You look great! I love the sneak peak. I gained a bunch of weight and I am a small person. I was worried about losing the weight after my girls, but I bounced back quickly. I worked out before my girls and then again after and it comes off. I think with how healthy you are, you should be good. But I totally understand the insecurities. Thanks for linking up! I love the photo! 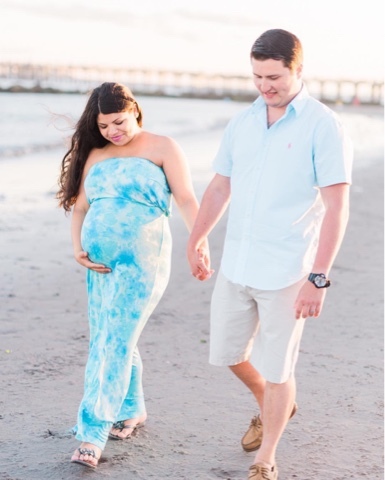 We are having our maternity photos done this weekend and I cannot wait! You look great! I love the colors on the beach.